The following conversation was originally posted on September 26, 2013. To read the original post and comments, please click here. In other news, Elizabeth Amisu and Karin Merx are about to launch a new website, michaeljacksonstudies.org, that they envision as an “online centre of academic studies regarding MJ.” It’s a wonderful idea, and could become a very useful resource for those interested in a deeper understanding of Michael Jackson’s work. Willa: A few weeks ago our friend Lisha McDuff sent us a link to a documentary about the biggest pop star of his time, and it was so fascinating to me – especially the way he redefined art to include areas we don’t typically think of as art, like his fame, his public persona, his speaking voice, and even his face. However, as the documentary makes clear, in a way he was forced to make his face part of his art because he suffered from auto-immune disorders that attacked the pigment of his skin. In the documentary, there are photos that show large white patches on his cheek and neck where the pigment has been destroyed. People who knew him later in life say his skin was unnaturally white, and he sometimes wore makeup that made it even whiter. He was also very self-conscious about his nose – he thought it was too “bulbous” – and he almost certainly had plastic surgery to make it smaller and thinner. And he was known to wear god-awful wigs that he intentionally “damaged” himself, whacking at the front with scissors and dying the bottom layers a dark brown, while leaving the top layers white or silvery blonde. Of course I’m talking about the Pope of Pop, Andy Warhol – an artist Michael Jackson met several times and pays homage to in his Scream video. Lisha, thank you so much for sharing that documentary, Andy Warhol: The Complete Picture, and for joining me to talk about it! While Warhol forced us to look at Campbell soup cans and think about our relationship with consumer culture in a new way, Jackson forced us to look at him – the little boy we’d loved since childhood who grew up into something unexpected – and challenged our assumptions about identity and race, gender and sexuality. That is especially interesting when you think about how Michael Jackson must have understood himself to be a trademarked product early on in life; he developed a star persona at such a very young age. Willa: That’s a good point, Lisha. Motown not only produced music but also thoroughly groomed their artists, giving them lessons in speech, etiquette, fashion, demeanor – how to eat and drink in public, how to walk and talk, how to give interviews in a way that presented an appealing persona to a large crossover audience. And for Michael Jackson, those lessons started at a very young age, when he was only 10 years old. Lisha: I’ve often wondered what it must have been like – learning to create a star persona that was even younger than his actual age. And what was it like for him to watch that star persona depicted as a cartoon character every Saturday morning on television? There are very few people in the world who could relate to that – developing a sense of self while learning to craft a public persona at the same time. So I never imagined how many striking similarities there were in the lives of Andy Warhol and Michael Jackson until I watched this documentary. I realized that both men grew up in steel towns, Pittsburgh and Gary, because their fathers were steel workers. They were teased about their noses growing up and they suffered from medical conditions that destroyed their skin pigment and caused early hair loss. They became shy and soft spoken. And as adults, both men responded in such an unexpected and wildly imaginative way, it has captured the public’s attention ever since – by creating a larger-than-life celebrity persona – using glasses, wigs, light skin and a re-sculpted nose. You could easily argue that Andy Warhol and Michael Jackson’s greatest works of art are: Andy Warhol and Michael Jackson. Willa: I agree, Lisha. When we think of art, we’re used to thinking about music, dance, painting, fiction, drama, poetry, sculpture, film, and all the other easily recognizable genres of artistic expression. But Andy Warhol and Michael Jackson didn’t just create incredible works of art – they also challenged how we define art. And perhaps their most important and experimental work hasn’t even been recognized as art, and that’s their innovative work with the art of celebrity and mass media, including the creation of a public persona, as you say, that captures and reconfigures the public imagination in important ways. And that interest in celebrity seems to have started at a young age for both of them. Warhol became obsessed with celebrities, starting a scrapbook of photos and autographs while still in elementary school. One of his prized possessions was a signed photograph from Shirley Temple addressed “To Andrew Warhola.” And of course, Michael Jackson later became fascinated by Shirley Temple as well, though for him it wasn’t just admiration. Because she was a child star and suffered some of the same experiences he had, he identified with her and seemed to feel a deep connection with her. Later they became friends, and he describes their first meeting in a very emotional way – like two survivors reuniting after a tragedy. The discussion of Warhol’s face and public image – especially his visual image – begins about 12 minutes in, and picks up again around an hour in. And here’s an extra treat: there’s an image of Michael Jackson on the cover of Warhol’s Interview magazine at 1:13:20. Willa: That’s so interesting, Lisha. I’d heard that quote before, but I thought he was joking! Lisha: According to his nephew, James Warhola, Warhol privately maintained that kind of child-like spirit throughout his life. Warhola wrote a children’s book titled Uncle Andy’s, which describes Warhol’s home as a giant amusement park full of carousel horses, antiques and all kinds of “neat” art. Sounds a lot like Neverland to me! Willa: It really does, doesn’t it? Lisha: I think it’s safe to assume Shirley Temple and that child-like spirit influenced how both these artists viewed celebrity as well. As Crispin Glover says in the documentary, “There are certain people in history that you can just put a few things together and that’s the person, like Abraham Lincoln, Teddy Roosevelt, or Groucho Marx.” You can easily see what he means. A stove pipe hat and beard = Lincoln. Nose spectacles and mustache = Roosevelt. A mustache, wire-rimmed glasses, and cigar = Groucho. Andy Warhol and Michael Jackson are most definitely that way. With Andy Warhol, the light skin and the silver wigs immediately come to mind. 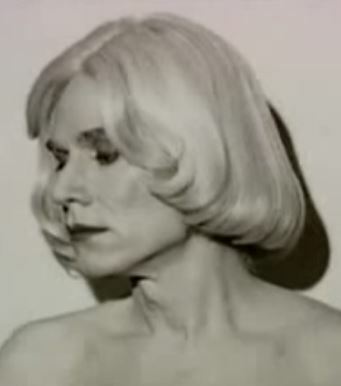 Matt Wribican, a curator at the Andy Warhol Museum in Pittsburgh, said that the wigs were something Warhol began to formally think of as art, and he actually framed some of them for that reason. Ultra Violet, a Warhol “superstar” from The Factory days, described how Warhol was creating a new mythology through his art – the mythology of Hollywood and the American Dream. Prosperity, glamor, and celebrity were a big part of Warhol’s art, and his own celebrity persona could be interpreted as an extension of that. With Michael Jackson, we think of the unprecedented fame, the hair and sunglasses; the sequined glove and the fedora, the signature dance moves, the “hee-hee” and “aeow”! That’s the cliched pop star image of Michael Jackson, anyway. Willa: That’s true, and it’s fascinating to really think about how those symbols function, and how powerful they are. For example, my son decided to dress up as Michael Jackson for Halloween a few years ago, so he put on a black fedora, a black jacket and pants, and white socks. I suggested he make his hair dark as well, but he said no, that wasn’t necessary – and he was right. My son went around the neighborhood as a blond-haired, blue-eyed Michael Jackson, and everyone immediately knew who he was. He didn’t have to look like Michael Jackson – he just needed to tap into that iconography Michael Jackson had created for himself. Those symbols overrode everything else so completely, my neighbors looked at a little blond boy and immediately thought “Michael Jackson.” And my son understood that at 12 years old – better than I did, actually. Lisha: Isn’t it interesting that it seems to work for all ages, races, ethnicities and body types, boys and girls as well? As long as you have some combination of those symbols, it is immediately recognizable. And come to think of it, there isn’t just one group of symbols that identifies Michael Jackson either. A retro 1980s club in my neighborhood invites people to come dressed as their “favorite Michael Jackson.” Think of the possibilities. Willa: That’s awesome! And you’re right – there’s different symbology for different decades. A red leather jacket evokes a different era than a white T-shirt and black pants. Lisha: Yes, for different eras and for different characters and songs, too. There are just so many of them: the armband, the surgical mask, the hair falling across the face, the glitzy military jackets, the arm brace, the glitter socks and black loafers … symbols that refer back to Michael Jackson and the whole “Michael Jackson” mythology. For example, the red leather jacket in Thriller or Beat It, and the white suit and hat in Smooth Criminal are symbols that were intended only for those specific songs and short films. And they became so inextricably attached to the music, it became necessary to include them in live performances as well. These symbols help form the characters that make up the whole “Michael Jackson” mythology. I remember reading an interview once with David Nordahl, one of Michael Jackson’s portrait painters, who talked about the contrast between Michael Jackson and “Michael Jackson,” the celebrity. Jackson didn’t like to sit for his portraits, so Nordahl painted from photographs. Believe it or not, he said it was difficult to get a good photograph of Michael Jackson unless he was “being Michael.” To an artist’s eye, Michael Jackson and “Michael Jackson” even photographed differently. Willa: Wow, Lisha, that is fascinating! And I think I know exactly what Nordahl is talking about. I’ve looked at thousands of Michael Jackson photographs, including a lot of candids, and it’s true – you can really tell when he’s “being Michael,” and when he isn’t. It’s like he strikes a pose, turns on the high beams or something, and transforms. It’s hard to pinpoint what exactly it is that distinguishes Michael Jackson from “Michael Jackson,” but you can sure feel it when you see it. Lisha: To a great extent, you could say that all stars have carefully constructed personae and masks they use to create a public image. The music and film industries study these images very carefully because the celebrity/star system is crucial to how they market their products. But in the case of Michael Jackson, I feel like there is a lot more to it. Has there ever been a star persona that was so complex and radically changing as Michael Jackson’s? I believe there is a far more serious artist at work here who, like Warhol, is not at war with celebrity, mass media, or commerce. In fact, I believe he saw it both as art and as a delivery system for his art. Willa: I don’t know, Lisha. I see what you’re saying, and I agree wholeheartedly that he was a very sophisticated choreographer of celebrity and the media, both to deliver his art and as an element of his art. In some ways, the mass media became part of his palette for creating his art, and I think that is so important and revolutionary. I really want to dive into that idea more deeply during our discussion today. But I think Michael Jackson would complicate that, in part because of his experiences with racial prejudice and other prejudices, in part because of the molestation scandals, and in part because of some frightening experiences with uncontrollable mobs of people when he was a child. I think those experiences gave him a deep awareness – maybe even a fear – of mass hysteria and that mob mentality that can take over sometimes. And when the media is portraying you in ways that are completely counter to your core beliefs, and in ways that feed a type of mass hysteria based on ignorance and prejudice, I think he would strongly disagree with Warhol. Lisha: I have to say you’re making some excellent points. And there’s no doubt that being a celebrated and powerful young black man dominating the entertainment industry is a very complicated situation to be in, bringing out all kinds of ignorance and prejudice. Willa: Exactly, and those are complications Warhol never had to confront, or maybe even consider. Lisha: But didn’t Warhol experience a lot of prejudice in his life, too? At a time when the white, male, heterosexual art world frowned on his appearance, his sexuality, and his success as a commercial artist? Willa: Well, that’s a very good point, Lisha. Warhol did face resistance and prejudice from “the white, male, heterosexual art world” – and that world was pretty macho and homophobic, especially in the 1950s when he was starting out. I guess I was thinking about their public personae, specifically their faces as a provocative form of art. Warhol changed the shape of his nose, lightened his skin (in part to even out his skin tone from loss of pigmentation), wore wigs – and that public face challenged social norms and became an important part of his art, as we were discussing earlier. But it didn’t set off the firestorm that resulted when Michael Jackson did the exact same thing. Lisha: I think that’s exactly right. There was a much different reaction to Jackson’s appearance than there ever was to the same changes in Warhol, which generated so much hostility towards Jackson. But, even so, I still have to wonder – was Michael Jackson truly at war with celebrity and the media in general, or was he attempting to update and correct flaws in the system? Lisha: Like Warhol, I think Michael Jackson was actually interested in some P.T. Barnum-style controversy, but there is an element in this that is beyond the celebrity’s control. One false allegation, fictitious scandal or unfair prejudice can ruin everything an artist has worked for their whole lives, through no fault of their own. We know the mob mentality is very real. Personally, I am very proud of the Michael Jackson fans who continue to challenge the media and expose some of the disastrous consequences created by the intersection of profit, news, and entertainment. I think Michael Jackson wanted to cooperate with the star system and use it to do good things, but he did not hesitate to point out where things went dangerously wrong, which again became part of his art. For example, I’m reminded of something Bruce Swedien mentions in his book, In the Studio with Michael Jackson. He worked with Michael Jackson for 30 years, and he and his wife Bea knew him – meaning the gentle-artist-working-in-the-studio side of him – very well. But then he’d step on stage, transform into “Michael Jackson,” and just blow them away. Swedien says, “Bea and I have traveled with Michael to his concerts, all over the world, [and] we have often thought that we don’t know Michael Jackson, the performer, that amazing person on stage.” They were like two completely separate beings. Lisha: People who saw that say it was truly astonishing. In My Friend Michael, Frank Cascio fondly remembers going to his first Michael Jackson concert, when he actually had to ask his father, “Is that the same Michael Jackson who comes to the house?” The onstage transformation was so complete. Lisha: That certainly challenges the white, male, heterosexual art world’s notion of who can be revered as a great artist, doesn’t it? Willa: It really does. But what perhaps defines our identity most of all is our voice, and Warhol even had a separate public and private speaking voice – something that’s frequently been said of Michael Jackson as well. I was very surprised to hear Warhol’s voice talking to his brother on the phone (about an hour and a half into the documentary) because it’s so different from the slow, banal public voice we’re used to hearing. We don’t know much about Warhol, the person behind the public persona – he’s a shadowy figure that we, the public, rarely saw. He was a devout Catholic who went to mass every week, a shy workaholic, and an innovative artist completely dedicated to his craft. But his public persona is very different: crassly materialistic, flippant, ironic, affectless, detached – an observer who drifted through the studio watching others create his work for him. In a couple of interviews, he said he wasn’t involved in creating his art anymore and wasn’t sure who was doing it – maybe his mother, maybe the cleaning lady. That’s a fabrication, of course, but that’s the image Warhol very deliberately created for himself. Lisha: Sorry, I have to take a minute and recover from the thought of Andy Warhol telling the press that he wasn’t sure who was creating all that artwork, but possibly his mom or the cleaning lady were doing it. That’s about the funniest thing I’ve ever heard! Willa: Oh, really? I hadn’t heard that, about either of them. Though if it’s true that Andy Warhol’s mom did that album cover, she really did have wonderful handwriting. And I guess we shouldn’t laugh too hard when Warhol implies he wasn’t creating his art himself because there’s an element of truth to it. What I mean is, Warhol didn’t create all of his prints himself. He was very involved throughout the process – designing them, specifying production details, reviewing them all – but he didn’t craft them all with his own hands. We don’t expect Calvin Klein, for example, to stitch every Klein garment – if he designs it, that’s sufficient to legitimately put his name on it. Yet there is an expectation that an artist will craft all of his artwork himself. Warhol challenged that, even calling his studio The Factory, and this is another area where he merged commercial art with high art to create not just new works, but a new aesthetic. And that new aesthetic is reflected in his persona as well. Lisha: Exactly. This was an excellent point that Dennis Hopper brought out in the documentary and he’s absolutely right. We tend to forget that all the great European masters had other painters working in their studios under the artist’s direction. It’s not like a single artist got up on the scaffolding and painted the Sistine Chapel. But there is such a powerful cultural myth in circulation – that of the tortured artist all alone in their garret, working away on a great masterpiece while refusing to “sell out” for their art – as in Puccini’s famous opera La Boheme. In reality, I believe that is a notion of 19th century Romanticism more than an accurate reflection of the creative process. But once you tune in to that story line, you can see how prevalent it is. Willa: That’s an interesting point, Lisha, and we see that bias toward the “solitary genius” even now in critical responses to Prince and Michael Jackson, for example. Prince is seen as the solitary genius alone in his studio, playing most of the instruments on his albums himself, while Michael Jackson was much more collaborative and perceived as more of a commercial artist. His thinking seemed to be that, if a musician dedicated to an instrument could play it better than he could, why not bring in the best? Lisha: Being a musician, I would certainly agree with that! But, the myth of the solitary mad genius is such a cherished cultural icon that, in a lot of ways, I think we’re still having Beethoven-mania! Like Warhol, Michael Jackson took the idea of working in collaboration to the extreme. On Dangerous, for example, the first album Jackson served as executive producer for, he had 3 production teams working simultaneously in 3 different studios for about 18 months to create the finished product. I don’t know if we’ll ever see those kind of production values again. The people who worked on the recordings talk about the unbelievable attention to detail that went into them, and the willingness of everyone involved to go all the way to create the best result humanly possible. So Michael Jackson was receptive to the ideas and talent around him, and he really used this to his advantage. Warhol seemed to have this ability as well – receiving help, ideas, and inspiration from many different sources. Apparently it was an art dealer, Muriel Latow, who suggested he should consider painting something as everyday and ordinary as a can of soup – the rest is history. And I was surprised to learn that Andy Warhol actually did eat Campbell’s soup every day of his life; it wasn’t all postmodern irony and a critique of consumer culture as I had thought. His mother always had Campbell’s soup for him when he was a child, and it really seemed to mean a lot to him – warmth, nourishment, a mother’s love. He was painting his reality, and I see those paintings differently when I understand that about him, as opposed to his cool, detached celebrity persona. Willa: Oh, I agree – I’ve always been struck by what a feeling of comfort I get from his Campbell’s soup paintings. They’re often interpreted as an ironic statement, as you say, and I can see that intellectually, but that isn’t how they feel to me emotionally. There’s a real feeling of warmth and reassurance there. It’s like he’s saying that the comfort people once found in the familiar icons of the Catholic church – the paintings of the Virgin Mary, for example – they now get from the familiar icons of consumer culture, like Campbell’s soup cans. So while artists in past centuries painted and sculpted religious iconography, his focus is on the new consumer iconography. It’s a brilliant insight. Lisha: It truly is a brilliant insight, the marriage of the precious and the everyday. That’s something we see in every aspect of Michael Jackson’s work, from the high production values he brings to the devalued genre of pop, to the exquisitely made, hand-beaded couture jackets he wears with t-shirts and Levi’s 501 jeans. Creating art and myth through his celebrity persona is just another good example. And as you were saying earlier, Willa, Michael Jackson takes the idea of the celebrity persona to a whole new level. I don’t even see how you could make an argument against it. I’m sure you’ve seen the 60 Minutes interview with Karen Langford, Michael Jackson’s archivist, when she displays some of his early writing which is now called the “MJ Manifesto.” It was Michael Jackson’s stated goal that “MJ” be a completely different person, a whole new character that he had big plans and ambitions for. MJ will be my new name. No more Michael Jackson. I want a whole new character, a whole new look. I should be a tottally different person. People should never think of me as the kid who sang “ABC,” “I Want You Back.” I should be a new, incredible actor/singer/dancer that will shock the world. I will do no interviews. I will be magic. I will be a perfectionist, a researcher, a trainer, a masterer. I will be better than every great actor roped into one. And you’re right. It really does show how deliberate he was in thinking about and creating this new persona, this “whole new character” of MJ, doesn’t it? Lisha: Every album had a new one. I’ll never forget the shock and awe of standing in the grocery store checkout line in 1984 searching for a photo of Michael Jackson, since that is about all anyone was talking about in those days, and when I couldn’t find it, somebody had to explain to me that I was already looking at a photo of Michael Jackson. It totally blew my mind as I tried to rectify the earlier Michael Jackson image I knew with the Thriller/Victory tour image I saw. Of course no one could even imagine what was yet to come. He morphed again and again, to the racially ambiguous character in Bad, to the boundary-crossing Black or White character on Dangerous, to the colorless alien “Other” in Scream for the HIStory album. But who was Andy Warhol? On his journey from Andrew Warhola, he would not only change his name but also customize his personality to create a mechanical, factory-produced brand name that would embody the celebrity and consumer culture of the times. That “mechanical, factory-produced” aspect of his “brand” was not especially attractive, at least not in the traditional sense. And neither were his wigs, for example, or his crassly materialistic public persona. But his wigs, his persona, and his brand aren’t judged by traditional standards of beauty or appeal because it’s understood that they were part of his art, and so they have to be interpreted in more complex ways, like art. So how does it change our perceptions if we begin to look at Michael Jackson’s public persona as an artistic creation, like we do with Andy Warhol? And how do we interpret it if we approach it that way? Lisha: Well, I think it would have been a much easier path for Michael Jackson had he initially made his private medical conditions public, broken the myth, and explained the changes in his appearance. He could have become an advocate for those like him who suffer from vitiligo and lupus, raising awareness of these diseases. I don’t think he would have had to take the relentless media bashing and persecution that he did, if that was his goal. But instead of benefiting just a few, I think Jackson saw a much bigger opportunity that still has tremendous cultural resonance today. Willa: I agree absolutely. I don’t think we’ve even begun to measure the impact his changing face – as a work of art – has had on us psychologically, as individuals, and culturally, as a global society. Willa: Absolutely, and the intensity of that backlash is an important indicator of just how profound and threatening this was – his transgression of a “fixed identity,” as Pinder calls it, based on traditional notions of race, gender, and sexuality. Michael Jackson challenged them all by “rewriting” his body, thereby complicating how identity is read through the body. Lisha: Media all over the world continue to speculate and fabricate stories about “Michael Jackson,” often disregarding factual information that has been available for some time. The media fiction almost always follows some variation of the “wacko,” “freak” or “monstrous figure” narrative, reflecting more about society’s need to “normalize” him than it ever did about Michael Jackson. And Jackson became so acutely aware of his function as a mirror of collective thought that he began exploiting it for artistic purposes, as in “Is It Scary” (“I’m gonna be exactly what you want to see / It’s you whose haunting me, because you’re wanting me to be the stranger in the night”) and “Threatened” (“I’m the living dead, the dark thoughts in your head / I heard just what you said, that’s why you’ve got to be threatened by me”). Willa: And we see that idea enacted literally in Ghosts when the Maestro enters the Mayor’s body, holds a mirror to his face, and forces him to witness his own inner “freakishness.” That freakishness the Mayor detests isn’t in the Maestro – it’s in himself. Lisha: That is such a brilliant scene – demonstrating his true mastery of the phenomenon. And yet another mythic, artistic creation of “Michael Jackson” was ready to “Heal the World,” imagining a new empathic civilization into being. One of his most impressive feats was to magically strip away the color of his skin to physically demonstrate once and for all “it don’t matter if you’re black or white.” When it became clear some still didn’t get the message, he took it a step further and became colorless – literally colorless. Scream and Stranger in Moscow demonstrate this so clearly. Willa: And it’s fairly clear that was a deliberate decision. Both videos were filmed in black and white with overly bright lights on his face to wash out the color, even gradations of color. Lisha: Absolutely. To me, it is obvious that this is the work of a brilliant and game changing artist. I hate to admit that it wasn’t until after Michael Jackson’s death that I finally looked at his work and realized what a new kind of art it was – imaginative and exquisitely crafted music full of sonic innovations and so-called “high art” aesthetics, synthesized with imagery and myth, delivered to the masses through the devalued genre of pop and the celebrity star system. But it was so much more – exploding off the stage and screen into our social discourses and everyday lives, encouraging us to go beyond our confused and violent past. And although I wasn’t paying attention at the time, I came to realize how powerfully affected I was by Michael Jackson, without even knowing it. From 1969 to 2009, Michael Jackson was a constant presence, and I don’t believe you can overestimate the impact he made. Judging from the intense media coverage of his death, I wasn’t the only one who suddenly wondered what it was going to be like to live in a Michael Jackson-less world. Willa: Oh, I agree. I believe Michael Jackson profoundly altered our perceptions, our emotions, and our affective responses to differences of race, gender, sexuality, religion, family relationships – stereotypes of all kinds – though we may not realize it yet. As you said, we were “powerfully affected … without even knowing it.” And I believe he also revolutionized our ideas about art, though he was so far ahead of his time we don’t realize it yet. Some of it we still don’t even recognize as art! We were in the midst of a gripping artistic experience without even knowing it. It’s going to take a long time for art criticism and interpretation to catch up with him, I think, and begin to comprehend the enormous impact he’s had, both in terms of art and how we conceptualize art, and in terms of the deep cultural shifts he helped bring about. And that’s another way to evaluate an artist – by the depth and extent of their influence. Near the end of the documentary, the narrator describes how Warhol’s influence is a constant presence in contemporary life, and then asks, “How can we miss you if you won’t go away?” You could ask the same question of Michael Jackson. He legacy is everywhere – from direct artistic influences on music, dance, film, fashion, to more subtle but perhaps more important cultural influences, such as how we read and interpret gender and racial differences. Summer Rewind Series, Week 8: Who Is It? NOTE: Next week, we will begin our new season with all new posts, starting with a conversation with our friend, Joe Vogel about his new book, Featuring Michael Jackson! The following conversation was originally posted March 1, 2012. To read the original post and comments, please click here. Willa: You know, Joie, there are so many things I love about Michael Jackson’s videos, but one reason they’re so compelling for me is their emotional complexity. Human psychology is not simple or straightforward. None of us is purely good or purely evil – we’re all a complicated mix of conflicting emotions and desires. And Jackson’s videos aren’t simple or straightforward either. They feel emotionally honest to me because his characters are complicated, even contradictory, and you find yourself drawn to them even if there may be some unsettling or uncomfortable aspects to them – just like real people. All of this has me thinking about Who Is It, one of his less well known videos. (In fact, I don’t even think it’s on YouTube anymore. I couldn’t find it when I looked the other day.) On the surface, the plot of this video sounds simple enough: a wealthy man is betrayed by a duplicitous woman who’s just using him for his money. That’s a story older than the Bible. But every time I watch this video, I find myself drawn to her as well as him, and it’s clear Michael Jackson wanted us to feel that way. She’s portrayed as a sympathetic character, and the way the story is set up, we find that she has complicated reasons for acting the way she does. In fact, in many ways she has more constraints on her than he does. He’s a wealthy man who can fly off in a helicopter when things get bad, but she doesn’t have that freedom. As the video makes clear, she’s stuck in her life. So while I sympathize with him and the heartbreak he feels because of her betrayal, I’m reluctant to judge her too harshly for that betrayal – especially when she tries to break free of the constraints on her and present her “true face” to him. Joie: Willa, I agree with you completely here and I have always loved this video simply because of the storyline. Normally, as you know, I would say that I didn’t care for this video because there’s just not enough Michael in it, and you know how I love to sit and gaze at him! But I can’t dislike this video because the storyline is so endlessly fascinating to me. In fact, every time I watch it, I find myself trying to fill in the blanks and create a back story! I want to know who is this woman and how did she get caught up in the destructive cycle she’s in; how did she meet the wealthy man that Michael is portraying and how did they fall in love; who are the shady people she’s working for and how did they coerce her into this lifestyle? I often find myself wishing that I could sit and watch the whole story play out as if it were a TV movie or something. I just love it! In the video, I think it’s pretty clear that she is a high-priced call girl, but it’s more than that. She’s also a skillful con-artist and she works for some really shady people who seem to have invested a lot of time and energy into the task of taking money from wealthy people. They have trained her to become a different person for each client, being exactly what each client wants and bringing his or her fantasy to life. We see them transforming her from Alex (a very ‘real,’ unpretentious girl) into Diana (a blonde, buttoned up business woman for a tryst with a mysterious man), into Celeste (a brunette vixen in killer lingerie who strips while her client, an older gentleman on oxygen, watches), into Eve (a coquettish “innocent” with a million curls who we later see dressing and leaving the hotel room of three satisfied sleeping women). Interestingly, Michael appears to have encountered the unpretentious, ‘real’ Alex – but is that the real her? Tell me what will I do? Willa: I know exactly what you mean, Joie. Every time I watch this video I’m left wondering, Who is this woman? Or as the title says, Who Is It? As we’ve talked about many times before, beginning with the My Baby posts way back in August, over and over in Michael Jackson’s work we see this double scenario where he’s in a romantic relationship that also seems to represent his relationship with his audience. And I strongly sense that double relationship again here. He’s in love with a woman who’s ever-changing, and he doesn’t really know who she is – and wow, is that true of his audience. After all, his audience includes people who love him, but it also includes music critics who don’t understand him and came down really hard on him, and music industry executives who just wanted to use him and make money off him, and casual fans who liked him as long as he was cool but turned against him as soon as he wasn’t, and even haters who actively disliked him. Remember, this video was produced in 1992, right before the molestation scandal erupted. We tend to look back and think everything was wonderful before 1993 and terrible after, but that’s not true. The backlash started before 1993. In fact, I think that’s one reason so many people were willing to believe those false allegations based on such faulty evidence: because public feelings toward him were already really confused and complicated at that point. A lot of people wanted him to remain the cherub-faced boy of the Jackson 5, but he had grown up and become an extremely powerful and wealthy young man, with an estimated $500 million in the bank. And his appearance kept changing – just like the female lead in Who Is It. So there began to be this unsettling feeling that maybe we really didn’t know this sweet-faced boy who had grown up in front of us. We thought we knew him, but did we really? Just like he thought he knew the woman in Who Is It, but did he really? In fact, this sounds kind of crazy, but the more I’ve thought about it, the more I think the situation is reversed this time, and the woman in Who Is It is him, Michael Jackson. Joie: That doesn’t sound crazy at all, Willa. In fact, I was thinking the exact same thing! Willa: Really? I’m always so worried you’re going to think I’m a nut, and always so grateful when you don’t. But there are a lot of parallels between them, aren’t there? After all, her career as a call girl depends on pleasing her clients, just as his career as an entertainer depends on pleasing his audience. She’s constantly shifting identities to meet the demands of different clients, just as he was constantly shifting his appearance and constantly having to deal with the demands of different segments of his audience. You know, at different times in his career, he was criticized by different groups as too mainstream, too edgy, too popular, too paranoid, too soft, too angry, too Black, too White, too predictable, too incomprehensible, too eager to please his audience, too out of touch with his audience, and on and on. It also really strikes me that, as a call girl, she’s a type of artist – a con-artist. Just as importantly, what she’s “selling” to her clients is the most intimate part of herself, of her being. And I believe that Michael Jackson’s art was the most intimate part of himself. I think the reason his work moves people so powerfully is that, if you’re in tune with him, you feel that he is revealing his innermost feelings – all his joys and fears and hopes. And through his art, he’s putting his private thoughts and emotions out in the marketplace and making them available to a public who may or may not understand him, and may cast judgment on him. To me, that is such an incredible act of courage, but it also must have been terribly painful – especially since he did genuinely care about his audience. And so I think he strongly identified with this woman in Who Is It, a very successful call girl who makes the “mistake” of falling in love with a client, just as he was a very successful entertainer who made the “mistake” of genuinely caring about his audience. And I think that’s one reason I feel such sympathy for her whenever I watch this video. Joie: Willa, I think you are right on the money with this one and I agree completely. And I think Who Is It is actually one of his finest videos for exactly this reason. It’s absolutely brilliant! If you just listen to the lyrics of the song, it really doesn’t lend itself to this type of storyline. The song suggests that this is a man who has discovered his woman is having an affair with another man. “Who is it?” he sings. “Is it a friend of mine? / Is it my brother?” The song itself is pretty straightforward. But the short film is so much more complex than that. As you say, he identifies with the woman in the video, and he clearly wants us to see beyond her shortcomings and feel sympathy and compassion for her and the predicament she finds herself in. She is “stuck” in her life, as you put it. She doesn’t have a lot of options. And as I watched it recently, I couldn’t help but wonder if maybe Michael was trying to convey a message with this video. The message being that he and this woman really are not all that different. She’s out there giving her all, to the shady people she’s working for as well as to the actual clients themselves. And in a very real sense, Michael was in the same exact position. Out there giving his all – to the music industry executives, to the critics, to the haters, and to the fans. And I’m sure there were probably times when he too felt sort of “stuck” in his life, just as the woman in the video does. And I think, on some level … at some point in time … we all probably feel that way at some time in our lives. So she really is someone we can all relate to. Willa: I agree. And of course, one of the most striking similarities between her and Michael Jackson as a public figure is their constantly shifting appearance. As you pointed out earlier, her appearance changes dramatically from Alex to Diana to Celeste to Eve – in fact, her appearance shifts so radically you can hardly tell she’s the same person. It’s all just hair and make-up, but the transformations are incredible. At first glance, he looks radically different in these two pictures. But if we take the time to actually look at the structural lines of his face, they are identical, even though 16 years have passed. If you outlined the details of his face in the photo on the left and the photo on the right and then put the outlines on top of each other, they would be identical. He looks radically different, but like the woman in Who Is It, it’s all just hair and make-up. Joie: It is all just hair and make-up, Willa. And in the case of Michael’s many pictures, it’s also lighting and camera angle and facial expression. My favorite photo comparison is the composite photo from the Vindicating Michael blog where they took a picture from 1988 (from the Bad era) and a picture from 2007 (from the Ebony photo shoot) and put them together. This composite picture clearly shows that his face is exactly the same; there were no dramatic changes. The eyes, the nose, the cheekbones, jaw line, lips and chin. All exactly the same. And the two pictures used were taken nearly 20 years apart! If that’s not proof that he was telling the truth when he repeatedly said he’d had no other work done besides various procedures to his nose and the cleft in his chin, I don’t know what is. Willa: I’m so glad you mentioned that composite photo, Joie, because it really demonstrates something important: while public perceptions and interpretations of his face changed dramatically from 1988 to 2007, his actual face did not. It was all just hair and make-up and the power of suggestion. But while the woman in Who Is It shifts her appearance to please her clients, Michael Jackson must have had different motives, obviously, because his “clients” were not pleased. He was really challenging his audience, and a lot of people didn’t like it and were surprisingly angry about his shifting appearance. Seen within this context, the ending of Who Is It is very poignant, I think. The Alex / Diana / Celeste / Eve character tries to break free from her false life and reveal her “true face” to the protagonist. She arrives at his estate without the perfect make-up, the perfect hair, the glamorous clothes, the regal attitude. This to me is the “real” person, whose name we don’t know – the person behind the mask. But she’s too late. He’s gone. His assistant shakes his head when she asks to see him, and then tosses all the false name cards out at her: Alex, Diana, Celeste, Eve, and more. In effect, he’s forcing her to acknowledge those false identities. So she goes back and re-enters the life she tried to escape. In our last image of her, she’s lying on the make-up table as that same crowd leans in to remake her identity once again. And then, in a classic Michael Jackson moment, the perspective suddenly flips and we, the audience, are lying on the table looking up at the people leaning over her/us. We have become her. To me, that sudden shift in perspective that places us in her position is quintessential Michael Jackson. Even while leading us to sympathize with his character’s heartbreak, he also encourages us to consider her point of view as well. We see these shifts in perspective throughout his work, from “Ben” through “Dirty Diana” through “Whatever Happens.” In Ghosts, he even takes us inside the mind of the Mayor (the Tom Sneddon character) and shows us the situation from his point of view, which to me shows incredible generosity of spirit. He constantly forces us to look at situations from multiple perspectives, including points of view that have rarely been considered before, and I love that. I’ve loved it since I was nine years old. Joie: You know, one of the things I find most intriguing about this video, Willa, is the fact that we really don’t see a whole lot of Michael in this one. And the reasons for that are really sort of shrouded in mystery. There is a lot of contradictory information floating around the Internet about it, with many fans believing that this video was actually banned from American TV, and the accepted story is that Michael was extremely busy at the time with the Dangerous Tour and just didn’t have the time to fully devote to the making of this video, so it was produced without his creative input. I’m not sure how true that is but, there are two things that are known for certain. First, the song “Who Is It” was never supposed to be released as a single in the U.S., but Michael’s impromptu a cappella, beatbox version of it during the Oprah Winfrey interview on February 10, 1993 really piqued the public’s interest in it. Requests to play the song went through the roof at radio stations across the country. So Sony decided to go ahead and release it instead of “Give In To Me,” which was slated to be the next U.S. single. (In fact, Michael debuted the video for that song during the Oprah interview for that reason.) The second thing that’s certain is that, for whatever reason, a Michael Jackson impersonator – E’Cassanova – was hired to finish filming certain scenes and if you look very closely at all the scenes of Michael in the limo and lying down on the plane at the very end, you can clearly see that it’s not him. Willa: Are you kidding me? That’s an impersonator? How do you know all this stuff, Joie? You really are incredible, like a living, breathing Michael Jackson encyclopedia. You just constantly amaze me. Joie: You are so funny! That part is pretty much common knowledge. Willa: Really? Well, I completely missed the memo on that one, because I had no idea. Joie: But here’s where it gets confusing … people say the impersonator was hired because Michael was too busy with the tour and everything to complete filming but yet, this video was actually made in 1992. Now, I’m not certain what month it went into production but, it debuted in the UK on July 13, 1992. That means filming more than likely occurred prior to the month of July and the Dangerous Tour began on June 27, 1992. And while I’m sure he was probably very busy with tour rehearsals and preparations right up until the kick-off date, I’m not sure I buy the whole ‘too busy to complete the filming’ story. But the facts get further complicated because on July 14, just one day after its debut in the UK, Michael had the video pulled because he was unhappy with the editing of the film and with its early release. I think this may be where the rumors that the video was “banned” from American TV originated, but the simple fact is, this video was never released in the U.S. Once Sony made the decision to release the single in America, they joined forces with MTV and created a contest where the fans could create a video for the song. So, in the U.S. the accompanying video was a compilation of earlier MJ videos and performance clips. The actual video wasn’t available in the U.S. until it was released on the Dangerous: The Short Films DVD on November 23, 1993. But the question that keeps popping into my head is why? The video for this song was obviously already completed by the time Sony made the decision to release the song as a single in America. They made that decision following the Oprah interview (Feb.10, 1993) and released the single on March 31, 1993. But the video had already debuted in the UK (July 13, 1992). So why not just release it here too? Willa: That is curious. Why the big scramble for a video when they already had one – a really fascinating one – sitting on the shelf? But I’m still boggled by the impersonator at the end. That’s just astonishing. Who does that? Who hires an impersonator to imitate them in their videos? And especially Michael Jackson, whose videos aren’t just marketing tools for his songs – they are exquisitely crafted works of art. Taking a shortcut like that violates everything I know about him as an artist. It just doesn’t add up. But you know, if we look at this a different way – if we look at it thematically – using an impersonator at the end actually adds a whole other level of meaning and intrigue to this video. Think about it. We have a female character who’s constantly shifting identities – and being condemned for that – and we as an audience are constantly unsettled by her shifting appearance and the recurring question of “Who Is It?” And then the final scenes are of Michael Jackson, but it’s not really Michael Jackson? It’s a Michael Jackson impersonator? I mean, seriously, how perfect is that? He is so endlessly fascinating to me, on so many levels. Just when you think you have something all figured out, he throws in yet another twist. Who Is It, indeed. I kept telling Michael that we had to have a rap, and he brought in rappers like L.L. Cool J and the Notorious BIG who were performing on other songs. Somehow, I didn’t have access to them for “Black or White.” … So, one day I wrote the rap – I woke up in the morning and before my first cup of coffee, I began writing down what I was hearing. … That’s the sort of thing he does, it seems kind of random, but it’s as if he makes things happen by omission. … I didn’t think too much of white rap, so I brought in Bryan Loren to rap my words … but he was uncomfortable being a rapper. As a result, I performed it the same day after Bryan left, did several versions, fixed one, played it for Michael the next day and he went, “Ohhhh, I love it, Bill, I love it. That should be the one.” I kept saying “No, we’ve got to get a real rapper,” but as soon as he heard my performance he was committed to it and wouldn’t consider using anybody else. the white rap section in Black or White uses black hip hop, but runs it through a white perspective, Bill Bottrell’s feel good lyrics and performance. The previous section, “I am tired of this devil” uses white hard rock and heavy metal but runs it through a black perspective and the frustration of racial injustice. He is deliberately confusing musical codes here, attempting to integrate all these perspectives into a single view in a very trans-ethnic way. So Michael Jackson really needs a “white rap” for this section, but he’s working with a producer who actively dislikes “white rap.” But he ingeniously figures out a way to get him to create it for him. As Bottrell said, “That’s the sort of thing he does, it seems kind of random, but it’s as if he makes things happen by omission.” I love that quote, and I can just picture the situation. Somehow all these amazing rappers are walking in and out of the studio, and they’re all willing and eager to be on a Michael Jackson album. Yet they’re mysteriously unavailable for this particular song – as Botrell says, “Somehow, I didn’t have access to them for ‘Black or White’” – so finally he has to do it himself. I’m sorry, but that’s brilliant. Joie: I agree; it is brilliant. Willa: I see the exact same scenario of “he makes things happen by omission” in the final scenes of Who Is It. It makes so much sense on so many levels to have an MJ impersonator performing those scenes, so the real Michael Jackson simply makes himself unavailable while those scenes are being filmed. Suddenly he’s too busy, can’t come, studio time is incredibly expensive, they can’t wait, and they’re forced to use an impersonator. Brilliant. Joie: You may be right about that, Willa. It certainly would be an interesting artistic move, wouldn’t it? And it totally shuts down the Internet rumor that Michael had no creative control over this short film. The video was shot by movie director David Fincher, who directed 2008′s The Curious Case of Benjamin Button and 2010′s The Social Network, among many others. He’s also directed numerous music videos for everyone from Madonna and Paula Abdul to the Rolling Stones and Nine Inch Nails. His list of video credits is just as impressive as his movie credits, and we all know how Michael always liked to work with the best in their fields. Willa: Oh, I think he was very involved in Who Is It, from the conceptual development through production. It’s simply too him, right down to the shifting camera angles – it carries the stamp of his personality and his artistic vision throughout. All you have to do is look at it and you can tell he was very involved in creating this video. And he wouldn’t have allowed it to be included in the Dangerous: The Short Films DVD if he were seriously dissatisfied with it. Everyone knows how meticulous he was. We’ve all heard the story of how he and Quincy Jones and others gathered around to listen to the final cut of the Thriller album – and he didn’t like it, and refused to release it until it met his standards. I don’t know what all was going on back then when the Who Is It video was released and pulled and released again – you know a lot more about that than I do, Joie – but I’m convinced this video deserves far more attention that it’s received, and deserves to be placed alongside his better known films. Joie: This week, Willa and I are thrilled to be joined once again by Lisha McDuff, a professional musician who many of you know as Ultravioletrae in the comments section. She’s joining us to talk about Black or White, a song and video that hold special meaning for her. [T]he white rap section in Black or White uses black hip hop, but runs it through a white perspective, Bill Bottrell’s feel good lyrics and performance. The previous section, “I am tired of this devil” uses white hard rock and heavy metal but runs it through a black perspective and the frustration of racial injustice. He is deliberately confusing musical codes here, attempting to integrate all these perspectives into a single view in a very trans-ethnic way (the way he uses his body). He is autonomously choosing the perspectives he wishes to use, ingeniously expressing the Black or White theme in the song. I’m so intrigued by this, and would really love to dive into this a little deeper so I understand it better. Can you explain in more detail what you hear going on in these two sections? Lisha: These two sections in Black or White have revealed so much to me, not only about how brilliant and meticulously crafted this song is, but also about Michael Jackson as a musician, a composer, and all around force for good on the planet. It is such a thrilling concept: Black or White presents a literal “black or white” musical perspective. At any given point in the song, a simultaneous “black or white” musical idea is being offered to the listener in a way that embraces and honors both traditions. It suggests going beyond our false distinctions and ethnic boundaries. But at the same time, the song addresses some very serious issues and really challenges the listener on a more subtle level. There is a lot going on in the song and in the film, and it’s easy to be fooled by its deceptive simplicity. At first, I was just curious about the song’s structure. There are two “middle 8” sections in the song, which just means there are two sections in the middle of the song that are each 8 bars long. The function of a “middle 8” is to introduce a new and interesting musical idea that sets up the return of the final verse and chorus. I’m talking about the “I am tired of this devil” and the “white rap” sections. While there are no hard and fast rules in song structure, it is more standard to have only one “middle 8” section, not two. Willa: And we usually call that “middle 8” the bridge, right? But this isn’t just a long bridge – a “middle 16,” as it were. It’s actually two separate bridges juxtaposed in a very sophisticated and interesting way. Is that an accurate way of seeing this? Joie: Lisha, I have to say that I just love talking to you about Michael’s work because you always bring such a unique perspective to the conversation. As Willa said the last time we spoke with you, it’s like you’re granting us entrance into a world that we can’t enter on our own, not being trained musicians as you are. This whole discussion of the two middle 8 sections in Black or White is completely fascinating to me, and so much more sophisticated and complex than you would expect a “pop” star to be. Bottrell was selected to co-produce Black or White for the very reason that he would bring this rock/country perspective to the song. So from the very beginning, a “black or white” musical idea was beginning to take shape. Bottrell describes this song as having a Southern rock feel, achieved through his interpretation of the music Michael composed. He plays the famous guitar riff and many other parts throughout the song. Interestingly enough, it was Bottrell who had the idea to insert a rap section in the middle, not Michael. This led Michael to suggest placing a heavy metal section right next to it, side by side. However, I don’t believe Michael ever fully revealed his idea for these two middle sections to Bottrell. If you’ve ever looked at the credits on this song and wondered, who is “LTB”? Now you know! Willa: That story just cracks me up! As you showed so well, Lisha, he really needed a “white” rap for this section to balance the “black” rock, so he simply makes all these incredible rappers coming in and out of the studio unavailable for this particular song. As Bottrell says, “Somehow, I didn’t have access to them for ‘Black Or White. '” Finally, he’s kinda forced to do it himself. That whole situation is too funny – I can just picture Michael Jackson telling him, “Ohhh, I love it Bill, I love it.” I think Bottrell is right – he really does “make things happen through omission” – and it’s pretty astute of Bottrell to pick up on that. Lisha: I could laugh about it all day – I find that so hilarious. And it is just such a great example of how Michael used multiple perspectives as a compositional technique in this song. Genius. There is no better way to capture a certain perspective than to just utilize someone who is genuinely approaching music from that perspective. Willa: That’s a really interesting way to look at this, Lisha. So, to begin expanding out to the other sections of the film, the intro section is set in a “lily white suburb,” as you say, with an Archie Bunker-like father who is throning it over his family from his recliner. The mother is completely silent as long as he’s in the house – and once he’s gone, she just worries about how upset he’ll be when he gets home. It is so stereotypically white and patriarchal. Joie: That’s a very amusing assessment, Willa. Willa: It is funny, isn’t it? I think there’s a lot of humor in Black or White, though it’s subtle and often overlooked. So the son is upstairs listening to loud rock music, which is generally coded as white also, just like the setting, but he has a poster of Michael Jackson hanging on the back of his door, so already there’s a bit of ambiguity. The father stomps upstairs and demands he “turn that noise off!” then slams the door. The poster falls to the floor, the glass shatters – the first of many scenes of shattering glass in this video – and it just feels to me like Michael Jackson has been released by the shattering glass. He’s no longer safely encased in the poster behind the door. He’s now been let loose, like a genie from his bottle. The boy responds to his father’s demands with a blast of sound from his electric guitar – a mode of defiance that is generally coded as “white” – but ironically, that blast of sound shatters the windows of this insulated white suburban home and sends the father flying back to Africa and the origins of music, including ultimately hard rock and heavy metal. So it subtly forces us to question how we label and situate this music. After landing in Africa, the father observes Michael Jackson dancing with tribesman in traditional dress and body ornamentation, but they’re dancing to rock music, which again is generally coded as white. But this particular music was written by Michael Jackson, and is now forming the soundtrack for people around the world – Africa, India, North America, Russia – to engage with him in their traditional dance. So that “white” label is really being complicated and undermined on many different fronts. Joie: As usual, Willa, your observations are brilliant and dead on! And listening to your take on the opening shots of this video really highlights just how calculating and methodical Michael was about every aspect of this project – both the song and the short film. He obviously had a vision and a message … a mission, if you will, for this particular song and video, and it’s really interesting to dissect it and decipher what that message is. Lisha: You’re absolutely right, Joie, it’s not just a song – it’s a mission! And I really love what you said, Willa, about Michael Jackson being released from that shattered poster frame like a genie from his bottle. He comes in as such a powerful musical force when the song begins and we start to see the African landscape. The guitar introduces the strong musical motif, that famous 2 bar hook that repeats throughout the song. Underneath the guitar and the accompanying rock rhythms, you hear this light percussion with an African feel, things like cowbells and shakers. These percussive African-sounding instruments traditionally suggest the feeling of community and a continuous invitation to dance. As you point out, the short film extends that invitation out to the whole world. According to musicologist Susan McClary’s book Conventional Wisdom, “one of the most important facts about culture of the last hundred years” is “that the innovations of African Americans have become the dominant force in music around the globe.” The short film really emphasizes this point. But it also emphasizes another point each time the camera pulls away from these traditional dance scenes. The sound stage is revealed, the artifice of the scene is exposed. We have to ask ourselves the question, is this the way it really is? Do we really dance together in harmony all over the world? The way the sounds are layered and placed in the song tells a “black or white” story too. The white dominant culture is sonically represented by the overpowering guitar hook, but the African feel of the percussion underneath it is steady and understated, always inviting us to dance together in community. Willa: Those kind of details are so interesting to me, Lisha, and I love your reading of this. It reinforces the idea once again that the central themes of Black or White are being expressed on so many fronts – through the lyrics and dance and visuals, but also through the music itself and how the music is structured. Lisha: It is endlessly fascinating to think about the way the music itself gets used as part of the literal meaning in this song. One of the best examples is after Michael sings in the first verse “we’re one in the same.” Suddenly the guitar hook stops and all the musical focus is now on the down beat or the one. Beat one now carries a literal meaning of unity and oneness. “Now, I believe in miracles, and a miracle has happened tonight.” It happens again in the chorus when we hear: “If you’re thinkin’ about my baby it don’t matter if you’re black or white.” The emphasis on beat one is a sonic statement to remind us “we are one in the same.” Brilliant! Joie: Now that’s really interesting, Lisha. Of course, we all focus on beat one as we listen to the song – as was probably Michael’s intention. But I never realized that beat one was a musical representation of our oneness. Of our unity. That is truly fascinating to me! Let’s move on to the ending section of the short film, the part usually referred to as the panther dance. Almost from the moment the video was released on November 14, 1991, it was mired in controversy because of the suggestive way Michael danced and touched himself during the piece, as well as the uncharacteristic violence he portrayed. It was so controversial that many TV stations would only play the shortened version of the video, removing the panther dance sequence all together. The interesting thing here to me is that, as Willa has pointed out many times in other conversations, when it came to his art, Michael usually had a very specific reason for everything he did. He knew that the public, and the ratings machine, were practically salivating at the thought of his next video. Since the colossal success of Thriller and the resulting videos for that album, Michael’s short films were debuted with all the drama of a major Hollywood release. People would mark the date on their calendars and gather around their TV sets with baited breath to watch a new Michael Jackson video, and Black or White was no exception. It was first broadcast on MTV, VH1, BET and Fox (giving that network its highest Nielsen ratings ever). It also premiered simultaneously in 27 countries around the world with an audience of over 500 million viewers – the most ever to watch a music video! So Michael orchestrated this massive audience to sit and watch, knowing that what he was about to do would not only stir up controversy but would also be talked about for years to come! And I believe that’s exactly what he wanted from the panther dance – to create so much controversy that it would be assured that this song/video and its message could never be ignored or overlooked. Willa: Wow, that is interesting, isn’t it? It states pretty clearly that “his look” – meaning the appearance of his face, his body, his hair, his clothing – was part of his art, and he hints at that in the film as well. There’s the morphing faces scene, which is so interesting, and then at the end of that section the director, John Landis, steps into the frame of the film (once again disrupting the illusion of reality and emphasizing the constructedness of this film, as you mentioned earlier, Lisha) and says to the actress, “That was perfect. How do you do that?” It’s a joke, of course, but the implication is that they aren’t using special effects to morph between different people of different races and genders; rather they’re simply filming one person as s/he morphs between race and gender. And of course, Michael Jackson himself morphed across race and gender lines, and a lot of people wondered, “How do you do that?” This is echoed immediately afterwards when the panther appears and then morphs into Michael Jackson. So there’s a lot of morphing going on – across race, across gender, even across species. Lisha: I had never gotten that joke before. That is hysterical! Willa: Isn’t it funny? I love that line. Lisha: I do too, and what an insight into this piece and his entire body of work. When I go back and look at the physical images Michael released for the previous album, Bad, and even the photos of his outings with Madonna earlier in 1991, I see what we call “a person of color.” However, in this short film, what I see signifies white in my mind. I honestly think, and I am not exaggerating in any way, that this is arguably the most significant artistic creation of our time. This song and the physical image of the artist coming together in this way … I just don’t know what to say … I am awestruck by this kind of genius. Willa: I agree wholeheartedly. He just blows me away. And it’s so interesting how what you were just saying about his body kind of echoes what you were saying earlier about the middle 8 sections, where he takes a white music genre – hard rock – and runs it through a black perspective, and takes a black genre – hip hop – and runs it through a white perspective. By this point in his career his appearance may have registered as white, but he still vigorously claimed his black identity. So just as he was “deliberately confusing the musical codes” in those middle 8 sections, as you described so well, he seems to be deliberately confusing racial codes – specifically the signifiers written on his body – and challenges how we read and interpret his face and body. And we see that again in the panther dance that you were just talking about, Joie. His face does seem to register as white in the earlier sections of the video, as you mentioned, Lisha, but his racial “coding” is more ambiguous during the panther dance. For example, when he kneels in the puddle and rips his shirt open, I wouldn’t say his face and body in that scene can be easily classified as either black or white. But the message is definitely from a black perspective. It’s a strong protest against white imperialism, colonialism, racism, and oppression. Lisha: Those agonizing cries and yells in this scene are so expressive – you can feel centuries of pent up anger and frustration in his vocals that point to just that. Words and literal meanings just aren’t necessary. You understand from the voice and the visual symbols what is being communicated. And I think there is something more ambiguous going on here musically too. Many have described the panther dance as being a silent dance without musical accompaniment, but I really hear this differently. I hear a complex layering of sound that feels more like an avant-garde composition, exploring the musical value of all kinds of things like glass breaking, wind, and water splashing. It feels like much more than just a soundscape. Over the recorded dance steps you can hear these very rhythmic, sharp, crisp aspirants or little whispers that function like a percussion instrument to hold the music together and keep the beat steady. Other “mouth percussion” sounds are there too, like “cha,” “sss,” “hew,” and popping sounds with the lips. It’s possible that this alternative musical expression is another form of protest as well. Willa: Wow! That is fascinating! Lisha: The ending panther dance coda is a little masterpiece of its own, and it creates such a perfect bookend for the song. The opening drama with its white suburban setting creates one bookend and the black panther dance set in the city streets creates the other. Perfect symmetry. We have this “black or white” song, co-produced through “black or white” perspectives, with its “black or white” middle sections, placed between these two “black or white” bookends. There doesn’t seem to be anything here that hasn’t been thought out to the “nth” degree to communicate the message of the song, including the artist himself! Joie: Which goes back to what I was saying before about how he always had very specific, very calculated reasons for doing everything he did. When it came to his art, he really was very methodical and deliberate in his choices and his decisions. Remarkable! In fact, this sounds kind of crazy, but the more I’ve thought about it, the more I think the situation is reversed this time, and the woman in Who Is It represents him, Michael Jackson. The second thing that’s certain is that, for whatever reason, a Michael Jackson impersonator – E’Cassanova – was hired to finish filming certain scenes and if you look very closely at all the scenes of Michael in the limo and lying down on the plane at the very end, you can clearly see that it’s not him. So Michael Jackson really needs a “white rap” for this section, but he’s working with a producer who actively dislikes “white rap.” But he ingeniously figures out a way to get him to create it for him. As Bottrell said, “That’s the sort of thing he does, it seems kind of random, but it’s as if he makes things happen by omission.” I love that quote, and I can just picture the situation. Somehow all these amazing rappers are walking in and out of the studio, and they’re all willing and eager to be on a Michael Jackson album. Yet they’re mysteriously unavailable for this particular song – as Botrell says, “Somehow, I didn’t have access to them for ‘Black or White’ “ – so finally he has to do it himself. I’m sorry, but that’s brilliant. Joie: You may be right about that, Willa. It certainly would be an interesting artistic move, wouldn’t it? And it totally shuts down the Internet rumor that Michael had no creative control over this short film. The video was shot by movie director David Fincher, who directed 2008’s The Curious Case of Benjamin Button and 2010’s The Social Network, among many others. He’s also directed numerous music videos for everyone from Madonna and Paula Abdul to the Rolling Stones and Nine Inch Nails. His list of video credits is just as impressive as his movie credits, and we all know how Michael always liked to work with the best in their fields. Joie: Earlier this month, something truly wonderful happened. An event that I had been waiting anxiously for, for several months. Author Joe Vogel’s long-awaited book, Man in the Music: The Creative Life and Work of Michael Jackson was being released on November 1st and I had gotten the great pleasure of interviewing Joe for MJFC back in May. But even long before our interview, I was so excited about this book and I really pushed for an interview with him because I knew it was going to be something special. I had been a casual fan of Joe’s for some time and I had read many of his articles about Michael Jackson on the Huffington Post. What I liked about Joe’s writing was that I always came away from one of his articles with the sense that he was a lot like me – just a student of pop culture who happened to be a Michael Jackson fan. His insights were really fresh and inspired and I found his writing style sort of ‘down-to-earth’ and real, and reading one of his articles was always a treat for me. So, when I first heard about this book, I was crazy excited about it for two reasons: first, like I said, I was a fan. And second, it had never been done before. This is a book whose time had not only come, but was LONG overdue! And I knew that if anyone could do this book justice, it would be Joe Vogel; so I was extremely excited. In fact, after Joe granted me the interview for MJFC, I think I may have become sort of a mini-stalker, repeatedly asking him if there was anything I or MJFC could do to help promote the book. He may actually be a little bit afraid of me right now; I’m like a Man in the Music groupie. Willa: I don’t know, Joie. Joe seems pretty steady to me. I think it might take more than a Man in the Music groupie to rattle him…. But seriously, I know what you mean – I love Joe’s book as well, especially the level of detail he provides about how every song of every album was meticulously created. But the part I love most was entirely unexpected and, for me, a wonderful reaffirmation of the strength of Michael Jackson’s creative spirit: it was the very different look it provides of his creative life in his later years, particularly after the 2005 trial. Joe’s book completely contradicts the prevailing view of this period of his life. The narrative that has been repeated over and over depicts a man so hounded and harassed he was unable to stay in one place for more than a few weeks, unable to trust anyone, unable to work – just simply too hassled and distracted to create. But Joe’s book paints an entirely different portrait of this later period of his life. What we see in Joe’s book is an extremely gifted, creative, and dedicated artist deeply engaged with a network of artists around the world, working collaboratively to produce exceptional work. In fact, Joe suggests that this later period was arguably the most productive of his life, even though very little of this work was released to the public. Joie, I don’t know if this makes sense or not, but reading that part of Joe’s book made me so happy – it’s like I felt this load of grief lifting off me as I read it that I hadn’t even realized was there. I guess we all deal with grief in different ways, and for some fans, Dr. Murray’s conviction was able to bring about some sort of resolution, but that didn’t help me at all. I think in some ways I started writing M Poetica out of a need to try to deal with it. I think Michael Jackson’s work is so incredible, but nothing I was reading in the mainstream media even remotely corresponded with how I felt about him and his music and his visual art and what they meant to me, and that lack of appreciation added another layer of tragedy to the situation. So I started writing about how I saw things, and it did help me work through the sorrow of it all. But nothing has helped me as much as “The Final Years” section of Joe’s book. To me, Michael Jackson’s creativity was the guiding principle of his life. People betrayed him over and over again, but that creative spirit never did. It was always there for him, nurturing and sustaining him. He said in numerous interviews that he was most happy when he was creating and performing, and that he was most comfortable in a studio or on stage, expressing that creative energy and letting it flow through him. That’s why all those reports of a person too harassed and distraught to create were so troubling to me. But Joe’s book gave me the reassurance I needed that, even after the 2005 trial and all the other horrors of those later years, that creative spirit was still there for him and stronger than ever. Joie: I agree with you, Willa. It was a pleasant surprise to learn that he was still very much engaged in the act of creating beautiful music even then. And you’re right, we do all grieve in different ways so, it makes perfect sense to me that this section of Joe’s book would be sort of cathartic for you. I found it reassuring as well. Joe tells us that, not only was Michael in good spirits during that time but, he was also determined and excited about the work he was producing. I only wish that we could hear some of the music he was working on during that time, especially the classical album! I hope they do too. I would love to hear it. And can you imagine if David Michael Frank conducted the orchestra holding one of Leonard Bernstein’s batons with a white sequined glove? What a wonderful metaphor that would be, and a great image as well. Joie: I agree. I’m a fan of classical music myself and I think I would give just about anything to hear the classical music Michael composed; I would love that so much! So it was as if life itself was a constant creative process for him and I find that fascinating! Joe italicizes “during,” as if he can’t quite believe it. It’s like the songs are coming in such a torrent he’s starting work on Thriller while still recording Off the Wall. Joie: I wonder if all great artists exist this way, where the art – whether its music or painting or poetry or whatever – just seems to pour out of them. I’m fascinated by that thought. But, for me, what makes Joe’s book so special is the fact that it goes into such delicious detail for every single song of each album. Even giving info on many songs that were left off the albums. It’s almost like he’s giving you the chance to go into the studio and sit quietly by, watching as the entire album takes shape, as if you’re right there watching Michael work! That’s the feeling I get every time I open it up and begin to read. There has never been another book out there like it. It’s not merely a critique of Michael’s work; it’s more like a novel, a reference guide, a history text and a critical assessment all rolled into one. There is SO much information here, just a wealth of musical knowledge and insight into the creative mind and character of the greatest entertainer that ever lived. This book is incredible! And I love the fact that it never once strays into that uncomfortable territory of sensationalism and tabloid fodder that most other authors can never seem to resist when talking about Michael Jackson. But Joe never goes there; he remains completely professional and true to the subject – which is examining Michael’s craft. Willa: I know what you mean about feeling like you’re peeking inside the studio as he’s working, and discovering what that environment was like. I’ve never been in a recording studio so that was entirely new territory for me, and it was so interesting. For one thing, I never realized just how many people are involved in making an album. It may be one person’s vision – and Joe makes clear that every track of every album was a reflection of Michael Jackson’s own artistic vision – but it really is a huge collaborative effort. And for me, that explodes another myth, which is that Michael Jackson was isolated and alone for most of his life, disconnected from the world around him. Obviously his fame had a huge impact on his life, but all that seems to drop away in the studio. He had many warm, strong, enduring relationships with people he worked with on song after song for years, even decades. Willa: And sometimes he takes matters into his own hands. I remember hearing an interview with him one time where he said he worked on the bass line of “Billie Jean” for a solid week. He said that distinctive bass line is so important to the mood of that song – it’s like the foundation everything else is built on – so he worked and worked on it to get it just right. Many MJ songs feature the sound of air, wind, breath as percussion or sound scape or expressive vocalization. At the bridge in “Unbreakable” we hear the artificial sound of gasping for air through an oxygen mask as if on life support. Chilling. And in the very opening intro sound scape, we hear the purr of an engine moving around in sonic space but layered on top is the sound of a cat purr, cat being another common symbol throughout his work…. This happens all throughout the work. What is the sonic message? I’m really intrigued by this now and think it would be really fun to look at it in more depth sometime – at how he used different found sounds over the years, and the different soundscapes he created with them, and the ideas and emotions he was conveying with those sounds. And this wasn’t a passing interest for him. On album after album, he says he wants to create “sounds the ear has never heard” before. I think Joe has that idea quoted three different times from three different sources working on three different albums. It was like a career-long mantra for Michael Jackson – to push the envelope and create entirely new sounds and new ways of engaging with music. To me, this says that Michael had the ability to hear music in absolutely everything – a car horn, the crunch of leaves in the fall, the sound of the wind rustling through the trees, even a baby’s cry or his children’s laughter. I bet, if we could ask him right now, he would tell us that this was true. Willa: I think you’re right, Joie, and I think he tried hard to share that with us so that we could begin hearing the music of the world around us as well – both the natural world, as Joe describes so well in the “lush production” of “Break of Dawn” (“It is as natural and beautiful as the birdsong that unobtrusively appears throughout the track”) and the man-made world, as we hear in that pounding opening trilogy of Invincible. Joie: Yeah, I read that and was amazed. What an incredibly brilliant idea that was! Especially since he was sort of a “free agent” at that time, the biggest artist in the world without a record deal. Willa, this book of Joe’s is really the greatest comprehensive work on Michael Jackson’s solo career that we have ever seen. Honestly, I can’t think of any other book out there that rivals it. The only one that even comes close is Adrian Grant’s Michael Jackson: The Visual Documentary, which many fans refer to as ‘the Bible’ because it’s so all-encompassing. But that book, though incredible, is completely different from Man in the Music because it doesn’t solely focus on Michael’s art or even attempt to look at it in any real or meaningful way; it’s merely a reference guide. There is also Cadman and Halstead’s Michael Jackson: For the Record, which is a wonderful book with lots of great information on chart placings and such for each song – beginning in the early Motown days – but again, it doesn’t really go into the extreme detail that Joe does. It’s also strictly a reference guide, whereas Man in the Music is so much more than that. So, actually, in terms of providing an in-depth look at Michael’s adult solo work – the creation of each song on each album and the possible meanings behind them – Joe’s book really has no equal. It’s just amazing. You know, I am so devoted to this book that I intend to ‘Pay Michael Forward’ for Christmas this year. Everyone on my list is getting a copy! Joie: Willa and I are very happy to be joined by Joe Vogel this week. As you all know, his much-anticipated book Man in the Music will be released on November 1st, and now he’s just about to release a print version of his eBook, Earth Song. Thank you for joining us Joe! Ok, here’s what I would like to know. Why did you choose to single out “Earth Song” and write a separate piece on it? Do you have a special affinity for the song yourself, or did you simply become intrigued by Michael’s process – or obsession – with the song as you were researching for Man in the Music? Joe: I’ve always loved “Earth Song.” The power and majesty and passion of the song always just struck a deep chord with me. When I was working on Man in the Music, though, I was listening to all of MJ’s work so closely that many songs made new impressions. “Earth Song” was one of them. The more I learned about it and the more I listened, the more convinced I became that this was Michael’s most important song. It encompassed so much. The call and response with the choir, to me, is one of the most powerful moments in the history of music. Yet there was so little recognition for the song among critics. Very little had been written about it that wasn’t condescending and dismissive. So I wanted to somehow write about it in a way that would communicate its power – and I was excited about the prospect of really being able to zoom in on one song and do all the interviews and research with that kind of focus and depth. Willa: I loved that! The level of detail you provide is wonderful, and I love the way your book provides insights both into “Earth Song” and into Michael Jackson’s creative process as well. You begin your book by discussing how our world is in peril, and with descriptions of him experiencing that peril as an almost physical, wordless pain – and then you show him beginning to channel and shape and express those profound feelings into music. Can you tell us more about this process, and some key moments for how “Earth Song” came to be what we experience today? Joe: Sure. I think, first of all, the process of “Earth Song” provides a great window into how Michael operated as an artist. That’s what made it so much fun to write. You start making connections, putting pieces together. For example, I spoke with Matt Forger about this original concept of “Earth Song” as a trilogy (with an orchestral part, the song, and a spoken poem); after learning that, I returned to Bill Bottrell to figure out who the composer was that Michael was collaborating with and what it sounded like; Bill led me to Jorge del Barrio, who I subsequently learned worked with Michael on songs like “Who Is It” and “Morphine” as well. Through del Barrio I learned some wonderful insights about the concept/feel Michael was aiming for and how it transformed. So you speak to different people and all kinds of new connections emerge: new details, new angles. And you learn how carefully and thoughtfully Michael went about his work. In interviews, Michael tended to be really vague about his creative process, but what Earth Song reveals is how obsessed he was with every detail of his work from inception all the way to the final mix. He surrounded himself with great talent, but it was his creative vision and perfectionism that drove his projects. When I read this section of your book, I immediately thought of the Romantics. If we look at drafts of their poems, they did revise them and were in fact very knowledgeable and involved in the craft of creating poetry. They were skilled wordsmiths. But like Michael Jackson, they were reluctant to talk about that. They preferred to talk about creating poetry as an act of inspiration rather than craftsmanship, and tended to say they were merely scribes – writing down the words that some creative impulse larger than themselves expressed through them – rather than creators, which is an idea Michael Jackson frequently expressed. In fact, he kind of struggled to explain that during his deposition for the 1994 plagiarism case for “Dangerous,” saying that he did write all of his songs, but in a way he didn’t – they just came to him. I know you’ve studied the Romantics, so you know a lot more about this than I do. I was wondering if you could talk a bit about this Romantic ideal of the artist as merely a receptive channel for creativity to flow through, rather than a creator, and how that’s reflected two centuries later in John Lennon and Michael Jackson. Joe: A common metaphor in Romantic poetry is the Aeolian harp: When the wind blows, the music comes. You don’t force it. You wait for it. Joe: Michael believed strongly in that principle. That being said, Michael was without question a craftsman. He rarely released work in raw form. Another metaphor he liked to use to illustrate his creative process is Michelangelo’s philosophy that inside every piece of marble or stone is a “sleeping form.” His job as an artist, then, was to chip away, sculpt, polish, until he “freed” what was latent. So it requires a great deal of work. You might have a vision of what it should look like, but you have to be in tune throughout the process and you have to work hard to realize it. Willa: What a wonderful image! I love that idea of the “sleeping form,” and it really clarifies how creativity requires both inspiration and craftsmanship. The idea of the song reveals itself to you and creates itself, as Michael Jackson liked to say, yet it requires the skill and dedication of a craftsman to free it. Joie: Joe, in your book you talk about the absurdity of the fact that “Earth Song” was never released as a single in the U.S. even though Michael’s previous U.S. single, “You Are Not Alone,” debuted at number one. And yet, in other parts of the world, “Earth Song” was not only released as a single but went to number one in 15 countries. I agree with you when you say that decision was pretty telling – that the ‘powers that be’ didn’t feel the land of excess would tolerate a song with such an ‘in-your-face’ look at the human condition. But, I believe that decision was a huge mistake. I think, had it been released here, it would have done very well. Despite the dismissive reviews it received, it is a difficult song to ignore and I think it would have gotten significant radio play if it had been offered to the stations. Joe: You could be right. It’s hard to know. On the one hand, Michael’s popularity had waned in the U.S. because of the 1993 allegations. But his first two singles reached the Top 5. It’s odd how quickly Sony seemed to bail on the album after that in terms of singles. It would have been nice to at least see the song given a chance with American audiences. Joie: I love the way you compared “Earth Song” to John Lennon’s “Imagine,” saying that they both ask the listener to care for the world we have rather than dreaming of an afterlife. But can you talk a little bit about your statement that “Imagine” is more palatable to the average music listener than “Earth Song” is? Joe: Well, “Imagine” is an absolutely beautiful song that also happens to be quite subversive. Because it is so pleasant to listen to, and evokes such nostalgia, however, many people don’t really catch on to what it’s actually saying. It calls for revolution, but plays amicably in dentist’s offices and department stores. So some of its impact can be blunted in that way. When it plays at Times Square on New Year’s Eve, it serves as a kind of feel-good anthem. There is nothing wrong with that. In fact, I think “Man in the Mirror” is very similar in terms of tone and psychological effect. But “Earth Song” is different. It has a different urgency and intensity to it. Imagine “Earth Song” blaring out of the speakers at full blast on New Year’s. Better yet, imagine Michael performing it. Audiences would probably be stunned. The song wasn’t designed to make people feel good; it was designed to prick people’s consciences, to wake people up. Joie: Which only makes me wonder all the more how it might have been received had it been given proper promotion and radio play in the U.S.
Willa: And if it didn’t do well here, that would say something important too, since it did do well in many other countries. Joe: Great, prophetic art is often neglected or misunderstood in its time. There are so many examples of this, from Blake to Van Gogh to Tchaikovsky to Picasso. Michael was a student of history and art and he understood this. He was confident that the work he created would hold up over time. “Earth Song” is a song that was, and continues to be, massively popular throughout the world. But ultimately it was a song that was going against the grain — so the resistance, from corporate executives, critics and other gatekeepers, makes sense. Joe: Thank you for having me. It’s been a pleasure and I’m really pleased with the whole idea of Dancing with the Elephant as a space for thoughtful discussions on Michael Jackson. Joie: Thanks. Willa and I have been having a great time with it! I’m curious, now that the release date for Man in the Music is just around the corner and Earth Song is also on its way to being published in book form, what’s next for Joe Vogel? Do you have any plans for book signings coming up or other appearances? Joe: I’m working with my agent and publicist on all of the promotional plans for Man in the Music and I should have a clearer sense in the next few weeks. It’s going to be busy, but I’m excited for people to finally read what I spent all these years working on. Joie: Well, I pretty much devoured the advanced reading copy you gave to MJFC so, I know the fans are going to love it. It really is a wonderful book! Any new writing projects you’re currently working on? Joe: Ummm…. I always have a bunch of projects in progress. I can’t say yet which ones will materialize. Man in the Music and Earth Song could be it for me in terms of Michael Jackson books. But we’ll see. There are a lot of practical considerations that make it difficult, but it’s hard to resist if/when the wind blows. Willa: Well, we’ve really enjoyed talking with you. And if anyone reading would like to join in the conversation, Joe will be dropping in on the comments page this week, so you can post questions or comments for him there.